Begin your day's adventure with convenient hotel pickup; pickup time varies according to location. Please see Additional Information for details. Make the 30-minute drive in an open top safari truck from Puerto Plata to Damajagua, home to 12 spectacular waterfalls. 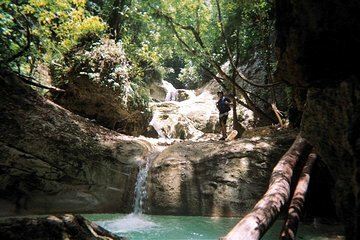 Hop out of the truck and make a 20- to 30-minute trek uphill to the falls, limestone pools, colorful stalactites and stalagmites. Swim, jump, and slide through the natural environment; younger children are welcome at the first cascade, but children must be 8 years or older for the upper cascades. On the way back to Puerto Plata, stop at the Country World Ranch and refresh yourself with a home-cooked meal, then get ready for ziplining. You'll be equipped with a helmet, harness, and a bottle of water. Zoom down eight ACCT-certified ziplines, the longest being 2,460 feet (750 meters) and stop in between lines for a walk through the forest. You can go at your own pace, along with your instructor, and pick tropical fruits off the surrounding trees if you get hungry. The day's last activity is horseback riding, an activity suitable for riders of all skill levels. You will be matched with a horse according to your comfort level and ability for a relaxed, scenic ride. 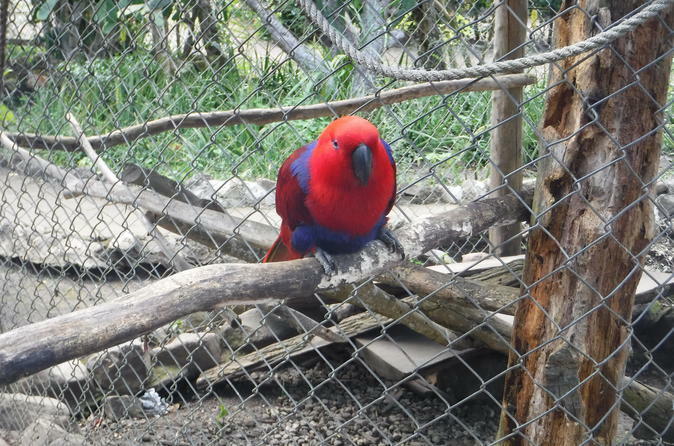 Before heading back to your hotel for drop-off, stop in a tropical garden to see some local flora and fauna. I highly recommend the Zip N Splash Adventure! Great value for your money. It is about an 11-12 hour day so be prepared to know that. I would recommend not taking any valuables on this trip. They do have lockers at the waterfalls location for 4 US. You can pay for a photo and video package but it is 50 US which I felt was a bit expensive. It would be nice to have known of the 50 package ahead of time. If you want to take pictures and videos yourself, I recommend bringing a waterproof pouch or waterproof bag to put your camera or phone in, but of course at your own risk as you will be jumping and sliding down waterfalls. The highest water fall is like a 20 feet jump. It was really FUN! There is quite a bit of walking maybe 30 minutes of walking for the water falls and also for the ziplining. If you have any current injury such as a leg, ankle or bad hip, etc..., I would not recommend you doing this adventure. The guides are all great and nice, and the tour is well organized. OVERALL, GREAT BANG FOR YOUR BUCK! This tour is a must. Between everything if offers, it is super fun but keep in mind it is a long day and you will be exhausted once its done. The ride from our hotel we stayed in the Playa Dorada complex was about an hour to the waterfalls. It was amazing to take in all the sights along the way like the wild cows, horses, and chickens, businesses and houses, and the ocean and mountain scenery. Once at the waterfalls, our guides, Chichi and Jhonny, were incredibly helpful and personable. They kept the group entertained and informed during the 30 minute hike to the waterfalls. Although the hike was a bit tiring lots of uphill climbing, including stairs, the waterfalls were worth it. They were thrilling to slide down and jump off of and the sights were spectacular. Follow everything the guides tell you and you will walk away with no abrasions the rocks can be slippery and tricky to navigate. After the waterfalls, we returned to Country World for lunch which was delicious. It tasted like an authentic Dominican meal and was leaps and bounds better than the hotel food. Following this we did the zip lines, which were fun and nothing to be afraid of if its your first time zip lining. Horse back riding was next, which was a little tricky because some horses have personalities, like the one horse who farted in all the other horses faces while riding, and another that kept nipping at the other horses tails. This wasnt bad though and as someone who has little knowledge on horses, it was cool to interact with them and learn more about them. Multiple guides even came riding along to make sure that no one got nervous during the ride. Finally, we walked into the petting zoo which was fairly brief but it was awesome to interact with the birds and monkeys. After that, we made the trek back to the hotel. Up until this point, I hadnt made mention of any of the employees at Country World. That is because ALL of them were super welcoming and professional and it would take awhile to name each one individually. They all enjoyed being there as much as we did. Seriously, if you have the chance to do this excursion, go for it. I would truly recommend Country World Adventure Park to anyone thinking of doing an excursion here. We booked the 3 in one which including ziplining, horseback riding/petting zoo, and the 27 waterfalls 12. My daughters and I had Edrice as one of our guides for ziplining. He explained every detail of the safety features and once we were all equipped with our gear and a water bottle, we started our excursion. We were the only ones there and it was awesome. The 8 ziplines were fun and it was so cool to see all the cows and horses as we ziplined past them. Once we were done ziplining, we walked to the horses and rode them for about an hour or more. My horse was the fastest and Edrice offered to stop and switch horses midway through the ride, but I declined. It was difficult to take pictures and hold onto the horse reins lol. These guys were great!!. After riding, we ate the BEST Dominican lunch on the Earth!!! Fried Plaintains, fried yucca, rice, beans, and seasoned chicken. And again, it was just the 3 of us. After lunch we walked to the petting zoo and held some parrots and a spider monkey. They even offered us to take a walk through the pineapple plantation while we waited for the transportation to the waterfalls. It was very hot that day, so we just stayed in the building. We then drove about 30 minutes to the waterfalls where there were different guides. Our guides Gabriel and 2 others were awesome. There were about 8 of us including my two 15 year olds and myself. Once they made sure we had life jackets and helmets, they told us what the tour was going to entail. We were going to walk about 30 minutes, taking a few water breaks in between, then arrive to the 12 waterfalls. Once there we would jump some or slide down some. Once we arrived to the first waterfall one guide went ahead and the others helped us climb the slippery rocks and helped us if we needed it. They were amazing. They joked with us and made us feel very comfortable. I chickened out of the 21 foot jump and went down the wooden steps instead. All in all, extremely pleased with this company and excursion!!! We wore water shoes for the entire excursion, and took a waterproof camera for the falls. Do yourself a favor and spray yourself with bug spray before each part of the excursion.They do have lockers for a few dollars to rent at the waterfalls and was well worth it. We tipped all of our guides which wasn't mandatory but they do appreciate and deserve it!! This tour was one of the highlights of our trip. The staff was incredibly friendly. We were a family of 5 that ranged in age from 42, 41, 20, 17 and 5 and we all loved it. My daughter had an allergic reaction while we were there and was covered in hives not from eating the food, but she has a lot of allergies. A staff member personally drove us back to our resort while the rest of my family continued with the excursion. That is true customer service! The lunch was great and the experience in general was outstanding. I would highly recommend. This was a great experience! The shuttle picked us up just outside the lobby of our resort, and immediately the fun began, starting with a 20-30 minute drive through the country side to the 27 falls trail head. Hiking up to the falls was not bad at all, and you can take your time, you are hiking through a jungle so you'll want to take your time to look at the vegetation, listen to the sounds, and soak it all in... there is really only about 1/4 mile up hill where you may need to stop every so often, but it really wasn't too bad at all! The trail splits and you will go left to the 12 of the 27 falls, or right to the other 15 falls, we went to the 12. I was really looking forward to doing all 27, but we still had a great time. Once to the top you will hike down the river, jumping off the falls, and sliding down the natural slides. My wife and I jumped every waterfall, but if you need to you can walk around them, but just jump, its way more fun! The highest jump was only 9 meters. Our guides were super funny and friendly, and all parts of the excursion were very enjoyable! After hiking and jumping the falls, we rode the shuttle to the ranch for a Dominican styled lunch, which was very good. After lunch we went through the zip line course, which was very fun and exciting, but not scary at all. Just go for it! The zip line course was followed by about a 45 minute horse back ride. These horses are extremely mellow and very well trained, anyone can ride them without any problem. Our horses obeyed our commands so it felt like more than just sitting on a horse that follows the horse in front of it. After riding the horses we went through the petting zoo and garden, which was fun and interesting to learn about the animals, and fruit/vegetable bearing trees/plants on the island. My wife especially loved the monkey, and the iguana. The guides were all outstanding, everyone was friendly, and wanted to help us enjoy the day. If we visit the Dominican Republic again we will definitely do this excursion again! I used a GoPro to record all parts of this experience, and then my GoPro camera was stolen from my suitcase after checking it into security at the airport while flying home from the Domincan Republic, otherwise I would have some great photos to upload. Once again, this was a great experience, we highly recommend it! The price was great too! We are a family of six, 4 teenage girls 13-18, M and D 50. The entire days was well planned and went off iwthout a hitch. The waterfalls are spectactular but it can be a bit of challenge to get to the top of the mountain to start the journey down. It takes about 30 mins to walk up the trails and at times the climb is very steep. No rock climbing, it's all trails and steps but it you are not at least in average shape, it could make for a longer walk. You are traveling about 400 meters up to the starting pointThe guides are great. They stayed behind with people in our group who were struggling to keep up during the walk and even carried peoples gear to lighten thier load. Once we got up to the falls the views are awesome and the water is crisp and clear. The guides again were great helping young and old manage thier way through the falls. The jumps and slides are exactly what a GoPro was made for to capture you and your families adventure. There is no presure to do anything you don't want to do. The highest jump is from a 7 meter fall. There is an option to walk around it if you would rather not take the plunge. The second half of the day was spent at Country World where we had lunch, zip lined, rode horses and my kids had the opportunity to hold monkey's, parrot's and pet an Igungna. Agian the guides different set of guides where great with everything. The zip lining was fun and easy to do for all ages and atheletic abilities. Again, it was well organized and went off without issue. The horseback ridding was the only place where we had any kind of issue. There were about 12 riders and it really needed to be spread out a little more but that's the only issue we had. This was a day that my family will remeber for the rest of thier lives and always look back on it with joy and fondness. This was a great tour, I would really recommend it. Jumping the waterfalls was the most scary and exhilarating experience I have ever had. I am in my 50's and went with my daughter in her 20's. It was a long hike up to the start of the waterfall jumping, with a stop or two to catch our breath. But once we started jumping into the falls, it was a blast. The guides gave us time to get our courage up and if you didn't want to jump a specific fall, you could walk around it. I did all the jumps, even though my daughter and one other girl opted out of the highest one. I didn't like doing the slides as well as the jumps. It is a good thing that you have on a life jacket and a helmet, as on one of the slides I hit my head and arm on the rock wall when I landed in the water and then hit the other side. It would have hurt without the helmet. I would recommend wearing shorts and a t-shirt along with a pair of walking shoes that you don't care if they get wet. Some people just wore bathing suits, but with the sliding you have to do on rocks, I wouldn't do it. There were two guides with our group and a photographer. We didn't purchase the CD at the end with photos and videos as it was 45 US. Then we were taken by open air bus to Country World, where we ate a typical Dominican lunch of rice, meat sauce, beans and fried vegetables eggplant, plantain and a salad. It was very good. After lunch we went ziplining. There were 8 or 9 different ziplines of different lengths. It was raining, but we were given plastic rain ponchos. There was a lot of walking involved to get to each zipline. It was a very safe activity. We wore helmets and safety harnesses. We had beautiful views of the surrounding countryside - very lush and green. Then we went horseback riding. The horses were placid enough for first time riders. The final activity was going through their small petting zoo. My daughter and I loved holding Jack, the spider monkey. He was soooo cute. We also got to hold large parrots. They also had flamingos, chickens, turkeys, ducks and rabbits. It was a full day of activities, well worth the price. We had an absolutely brilliant day! All the Staff members were so friendly and helpful. Waterfalls were great fun, we started at no.12 and slid, jumped, swam and walked our way down. Zip lines were awesome! Horse riding was very picturesque and felt very safe. All in all a highlight of our holiday!